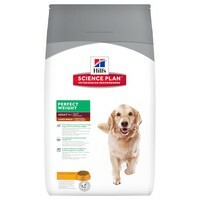 Hills Perfect Weight Large Breed Adult Dog Food has been designed specifically with a unique blend of ingredients and low fat content for dogs that are less active, neutered or otherwise prone to being overweight. Containing all the nutrients your dog requires, the food will help your dog achieve and maintain a healthy weight, which in turn will allow them to live a longer, healthier life. Weight Loss: Dogs at a healthy weight are less prone to develop weight related issues, and live happier, healthy lives. Maintain Lean Muscle: Supports healthy weight loss and maintains lean muscle. Gentle Digestion: Prebiotic fibres from beet pulp help promote nutrient absorption and gentle digestion. Increased Metabolism: Works to reduce inflammation whilst improving your pet’s metabolism to help avoid weight gain. Wheat, Maize Gluten Meal, Maize, Chicken (16%) And Turkey Meal, Pea Bran Meal, Cellulose, Tomato Pomace, Digest, Animal Fat, Flaxseed, Dried Beet Pulp, Coconut Oil, Minerals, L-Lysine, Dehydrated Carrots, Lipoic Acid, L-Carnitine, Vitamins, Taurine, Trace Elements And Beta-Carotene. With A Natural Antioxidant (Mixed Tocopherols). Protein 28.3%, Fat 12.6%, Carbohydrate (NFE) 40.2%, Fibre (Crude) 13.2%, Moisture -, Calcium 0.87%, Phosphorus 0.67%, Sodium 0.3%, Potassium 0.83%, Magnesium 0.13%, Omega-3 Fatty Acids 0.84%, Omega-6 Fatty Acids 2.21%, L-Carnitine 339 Mg/Kg,L-Lysine 1.67%, Vitamin A 7519 IU/Kg, Vitamin D 757 IU/Kg, Vitamin E 710 Mg/Kg, Vitamin C 98 Mg/Kg, Beta-Carotene 1.6 Mg/Kg.